Notes in [brackets and blue] are my recent comments to this old text. The complete Conlon Nancarrow 's studio belongs today to the Paul Sacher Foundation, in Basel. I decided to publish this text for the purpose of curiosity and diffusion, just for the Nancarrow's Fans. Further, up to date, precise information should be consulted at the archives of the P.S. Foundation. This information is quite reliable just because it reflects the studio as it was in Mexico, not as it is now in Basel. If you decide to quote it, please do it this way: "Carlos Sandoval, Nancarrow's studio and libraries in 1991-92: a general description published in www.conlon-nancarrow.de/libraries.htm"
This is an overall description of Conlon Nancarrow's books and records collections [as I found and catalogued them in the years defined in the head of this article]. In addition, it attempts to portray his studio and work environment. It is significant that Mr. Nancarrow worked in complete solitude from 1940 to nearly 1985 —so alone in fact, that his wife was not even familiar with his studio until quite recently. Therefore, the studio as I found it reflected the “complete” and “untouched” trajectory of the composer : since his first readings and attempts in percussion-like player-piano music, to the last results: a complete collection of more than 6500 books, and more than 65 player-piano rolls, punched by him. —The general-topics library, with a records section and a small sleeping room and "office". Finally, there is also the "storeroom", behind the studio walls, which contains a good number of old player-piano mechanisms (15?) and actions (10? ), a considerable number of percussion instruments (Part of his mechanized percussion orchestra. Some of them were exposed at the UNAM-hommage concert series curate by me), a lot of trash, old recorded tapes, some desiccated marihuana he uses to grow and smoke with his friend John Langley behind his studio (1) —and other curative plants, not at the exhibition. There was also a wine cellar. Although Mr. Nancarrow arrived in Mexico from the United States with a considerable number of books, the main part of his library was acquired [in old book street markets and specialized bookstores, there were some very good at that time] in Mexico City. His collection comprehends mainly books from the United States, UK, France, Germany and Latin America, in quantitative order. Mr. Nancarrow was an insatiable reader. Around the 50's, he had subscribed to nearly twenty different magazines, mainly about music, science, philosophy and psychology. In the words of Peter Garland, he was perhaps one of the most informed composers of his generation; the word “isolated” then, applied to him is truly pejorative. He was in touch with some heads of the modern-experimental American tradition of his former and actual generation: Cage, Carter, Cowell and Slonimisky among others. Most of them knew and recognized his talent and originality, as it is reflected in some of his correspondence. 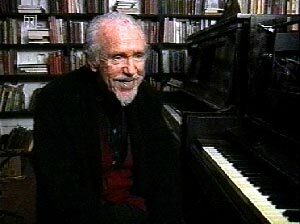 Nancarrow divided his 6500 volumes library in two sections: the MUSIC SECTION and the GENERAL TOPICS SECTION. He decides to put all the music-related books INSIDE his studio. The organization in sections is original by Nancarrow, as I found it in the shelves. Section 1 (ca. 190 books). — Musical instruments: history of; construction of; catalogs of; essays on; manuals of. — Sound theory of; acoustics of; psychophysics of; engineering. Section 2 (ca. 155 books). — Musical instruments: wind; percussion; bells and carillons. — sound: physics; engineering; hearing; acoustics; theory. Section 3 (ca. 190 books). — music: psychology; beauty of; therapy of; theory of; essays on; contemporary; conducting; dancing; miscellanea. — Composers: Stravinsky (37); American; others. — Music: history of (60). — Music: essays on; miscellanea. — Early music: essays on. China; Spain; African countries; Hungary (5 big volumes); others. — Jazz (60): history of; essays on. — Traditional music: essays on; percussion in; black; Cuba; Brazil; and other Latino American countries. — Mvsica disciplina (American institute of musicology) 7 volumes ca. 1950. — Musicology (m & h publications) 7 volumes, ca 1947. — Music and letters (Eric Blom. pub.) complete collection from 1958 to 1967. — Notes (musical library association) complete collection from 1945 to 1960. — Soundings (P. Garland, pub.) complete collection. — The musical times 15 volumes ca. 1930. — Journal of music theory (Yale) 25 volumes ca. 1958-69. — La revue musicale (nouvelle revue francaise) 6 volumes 1923-39. — Modern music (the league of composers & Lederman) complete collection. — Neutral música (Mexico) 3 vol., 1946-42; 12 vol. 1949-52. — Perspectives of new music (Boretz) 15 volumes, ca. 1963-72. — Revista Musical Chilena (Chile) 14 volumes ca. 1951-57. — Source (bmi) 9 volumes, complete collection. — The score (Glock) 15 volumes, ca 1950. — The music index, subject heading. (info. serv. inc.) 15 volumes, 1962. — Musical quarterly (lang) ca. 70 volumes containing issues from 1925 to 1974 complete. — The music review, ca. 90 issues. 2.2. The player piano rolls shelve Consist of 70 different rolls and 10 test rolls. Archive 1: Personal correspondence (1991-92), in alphabetical order. In chronological order by year; and alphabetical by names. 2.4. The musical instruments and player-piano machinery. 2.4.1. Musical instruments. This "section" is not quite determined. In general, consist of percussion instruments, cymbals and drums. There still some instruments built by Mr. Nancarrow himself (ca. 1945-50). There are many player-piano actions and piano supplies. A complete inventory will be available soon. 3. The general-topics section (ca. 4700 books), a general description. — Time: essays on; philosophy of; science and (60). — Coffee: essays on; culture of; history of. — Smoking: essays on; culture of. — Tea: essays on; culture of. — Insects and animals: diverse. — Alcohol and drinking: essays on; culture of. — Drugs: essays on; culture of; history of. — Relaxation: essays on (17). 5.1. Volume of books: 1500, aprox. 6. 98% of books in good condition. Rest, in regular or bad condition.